No one can flip pancakes quite like the Girl Scouts Heart of the Hudson Rye Troop 2820. 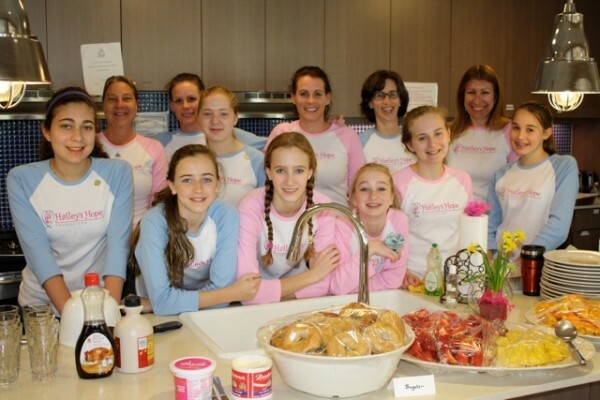 Just ask the families who enjoyed a delicious brunch prepared by the Girl Scouts and Hailey’s Hope Foundation volunteers on Saturday March 24th at the Ronald McDonald House of the Greater Hudson Valley (on the grounds of Maria Fareri Children’s Hospital) in Valhalla. By 9:00 a.m., they were hard at work making pancakes, cooking turkey bacon, washing and cutting fruit, preparing bagel platters, and baking brownies. For each of the families at the House, they also made beautiful tissue paper flowers to share with their children. “The Girl Scouts did a fantastic job with brunch,” said Donna Zion, Vice President of Hailey’s Hope Foundation. “They were pros. It was inspiring to see all the care that went into making the best meal possible for these families whose children are undergoing treatment for serious illnesses at the hospital.” A sweet treat that brightened everyone’s day!